In the first half of the 1960s the road network of Devon and Cornwall was not adequate to cope with the increasing holiday traffic as car ownership expanded. Congestion was rife, particularly around Exeter. This was no way to enjoy the start of the annual holiday. 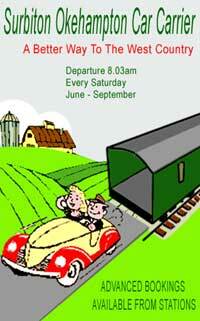 British Railways answer to this was the summer Saturday car carrier service from Surbiton to Okehampton, a precursor to Motorail. Comfort and speed attracted holidaymakers to the service. The cars were loaded into covered general utility vehicles (GUVs) via their end doors whilst passengers were conveyed in the attached passenger coaches. The train ran from 18th June 1960 - 12th September 1964 by which time travellers had migrated back to the improving road network rendering the service obsolete. The train formation comprised a Bullied pacific locomotive and 8 GUVs, initially finished in maroon livery but quickly repainted to SR green. A GUV capacity was 4 cars. An Ivo Peters photo of 1964 shows the passenger portion comprised of a Bulleid brake second open (BSO), Bulleid Kitchen/Restaurant (RS) and MK1 second open (SO). The GUVs and coaches carried the label SURBITON-OKEHAMPTON CAR CARRIER TRAIN, reportedly in blue on a yellow background. There is a superb colour photo in 'Southern Branch Lines' by Martin Welch of the train at Okehampton in 1962. The green GUVs are in the loading platform with their doors open whilst the passenger coaches comprising a Bulleid SO, Bulleid Kitchen/Restaurant and Maunsell Brake are berthed on the other side of the platform. The destination boards look to be yellow text on orange or red background. 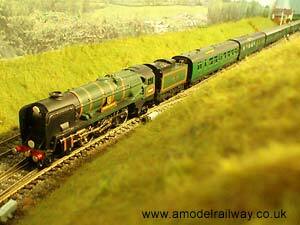 Bulleid West Country Pacific 34005 Barnstaple heads the 8.03 Surbiton - Okehampton car carrier as it passes Hewish sidings. 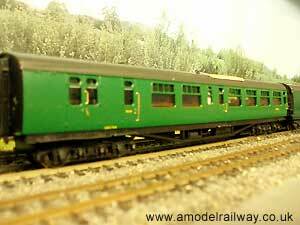 First coach is the Bulleid BSO manufactured by Bachmann. Destination boards carry the name Surbiton-Okehampton Car Carrier Train. 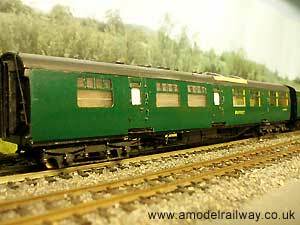 The Bulleid Kitchen/Buffet coach. This is not the correct style used in practice. It was a Kitchen/Restaurant, which has similar outward appearance but inside were extra dining tables instead of a buffet sales counter (I believe). Comet Models kit built. Usually allocated to the ACE. 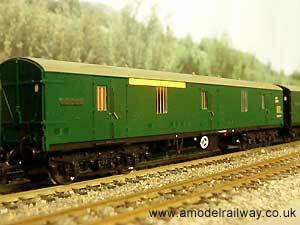 MK1 SO manufactured by Bachmann. 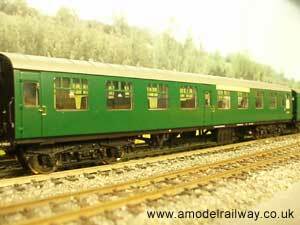 Mk1 GUV manufactured by Bachmann. 1 of 8 although only 4 are used in the model train formation to restrain the length on the layout. Potted history of car carriers and motorail. Join Southern E Group for Southern related information.